We all have one letter in our hands – it’s a part of a letter with a prison stamp, which seems to be addressed not just to people in one place, Ephesus, but to all places at all times. This fragment is intriguing because of the wonderfully motivating language, but because it touches on the behaviour of saints. It’s a letter to saints about how saints behave. In the letter WE are called saints so it’s a letter about how we behave. My sermon is playing for time – time for us to dwell on this fragment – time to gather round three hearths within the fragment. Please feel free to wander round this in your own way at any point, but for those who want to stay with me I start with a question that, for some reason kept bugging me while I was reading this letter. The question is, “Why did the guest have to leave the party?” It’s a question posed by the story from Matthew’s gospel (chapter 22). I’ve got an email here which might remind you of that story. It’s one of those “complaining” emails. “I feel I have to complain to you about the way you treated me at the party you organised. First of all, thank you for the invitation. I had thought that I would have been invited to one of your earlier parties because of the work I have done in the community. Anyway, I did manage to rearrange my diary so that I could join you in the palace. “I was shaken when your flunkies grabbed me and escorted me from the party. I can’t see what I did wrong. They said it was because of what I was wearing, but the invitation did say that the dress code was informal, and other people were wearing t-shirts and shorts as well. “What’s made matters worse is the media coverage. The headlines are awful and everywhere, and the film showing me weeping and gnashing my teeth has gone viral on youtube. You have made me a laughing stock. It has been so damaging, embarrassing and disrespectful. I demand an immediate apology. “And one more thing. I don’t know who did the seating plan, but I can’t understand why I wasn’t at one of the top tables. You don’t seem to realise who I am. “May I speak to you frankly? I do this in love. I felt honoured that you accepted my invitation, and that you made the time to come (many didn’t – which explains why there were so many people there who you’d probably only seen begging at the city gate). It wasn’t the clothes you wore (I rather liked that t-shirt you wore). No, it was the bearing that you were wearing. You were upsetting the party and upstaging the guests. You were resentful, argumentative and arrogant. You had to go. I am sorry that you felt embarrassed. That was never my intention. I hope you understand. As Christians we enjoy ourselves. We use the language of party – a eucharistic language. Sunday by Sunday there is eucharist, celebration, wine, good company, gifts, song and a party Spirit. It’s not a party to be missed for the food – the bread that gives life to the world. The party spirit of the worshipping community is captured by describing it as “Eucharistic community”. I want to share three hearths with you – the three hearths take us to the heart of what a eucharistic community is – what the party is about. At the heart of our eucharistic community is our “thank yous”. A eucharistic community meeting is full of thank-yous – count the “thanks” in the liturgy, in our prayers, in our scriptures, in our interactions. We are awash with thanksgiving. Thank you, thank you, thank you. The eucharistic community is raised in appreciation and thanksgiving – indeed, that is the very meaning of the word eucharist. Alice Walker, author of The Color Purple, says that “Thank you” is the best prayer that anyone could say. She says that she gets to say that prayer a lot: “thank you expresses extreme gratitude, humility and understanding.” Is that our prayer? Ephesians talks of “thank yous”. Here’s how The Message translates another verse (5:4) in the letter: “Though some tongues just love the taste of gossip, those who follow Jesus have better uses for language than that. Don’t talk dirty or sill. That kind of talk doesn’t fit our style. Thanksgiving is our dialect.” Thanksgiving is our dialect. Positive psychologists are also talking about the importance of gratitude and thankfulness as a transformative and converting behaviour….. In the depths of Eucharistic language there is gifting – and that is the basis of our gratitude and thankfulness. It is how “eucharist” is spelled. CHARIS comes in the middle of that word. “Charis” is left when you peel away the “eu” and the “t” from the beginning and end of “eucharist”. “Charis” is the heart of “eucharist”. “Charis” means “gift” and “grace”. We have words that are recognisably derived from CHARIS, for example “charity”, “charism” and “charismatic”. I wonder if the wedding guest was told to leave because he had no charm. According to our reading, there are two groups of people within a Eucharistic community. One group is made up of saints, the other group is made up of apostles (they are advocates), prophets (they speak from the heart of God to the heart of the people), evangelists (they are angels with only have good news to share), pastors (they shepherd) and teachers (guess what they do). Those are charisms that form a ministry team – and you can bet that some people here are part of a team like that – the beginnings of a team of people who are gifted and charmed to help this other group of saints, so that all of us are equipped for ministry until we find the unity that God has in store for us. All of us are charmed and gifted – but some are charmed and gifted to help the rest of us – be saints. The gifts God gives can only be valued by a Eucharistic community. They are gifts of ministry for the sake of the saints who live for the sake of the world. That’s the party spirit. The third hearth of a Eucharistic community is that we are communities in formation. We are still growing up, with growing pains which show in our joints and the way we join each other. Our relationships are always less than perfect. Outsiders often call us hypocrites because we so often don’t walk the talk. We often forget that we are still growing, that we have so much to learn, that we are building one another up. We often speak the truth to one another (try to teach one another a lesson) forgetting that the responsibility within the Eucharistic community is to speak the truth in love. That is the party spirit. I wonder if it was something about the guest’s bearing. Was it the bearing he was wearing? I wonder whether it is something about the church’s bearing which, in some quarters, has become branded as toxic. Thanksgiving isn’t always what hits people in the eyes. it’s not always obvious that we see ourselves only as children, only as “growing up”. Nor is it always apparent that we are thankful party people, or that we are always charming and blessing. Each place needs a community of thanksgiving, a community which is intentionally growing up, and a community which is charming and blessing, so that the ways of the world can be changed, so that so that life can be different, so that those who walk through the valley of the shadow of death may find hope, and may find a welcome at the table where all their hungers are satisfied, so that they may share the bread of life. 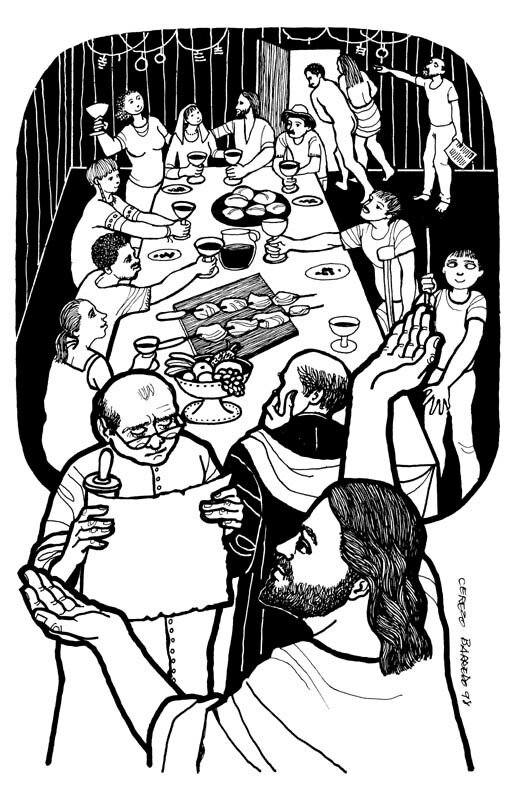 (The drawing is by Cerezo Barredo, part of series of illustrations for the Revised Common Lectionary – this one is of the parable of the wedding feast (Matthew 22). Posted in sermon.Tagged blessing, Cerezo Barredo, charism, charm, charm bracelet, community, Ephesians, Ephesians 4:1-16, eucharist, gifts, grace, Grappenhall, gratitude, growing up, Matthew 22, ministers, saints, St Wilfred's, thanksgiving, wedding guest.